Europe’s inland cruising market has been growing significantly, as was marked by the christening of 24 new river cruisers in the month of March alone this year. Now, this trend is beginning to spread to North America, as two operators add ships to the Columbia River, one orders three new river ships, a new coastal line begins service and yet another new operator plans to revive a long laid-up coastal and inland vessel next year. 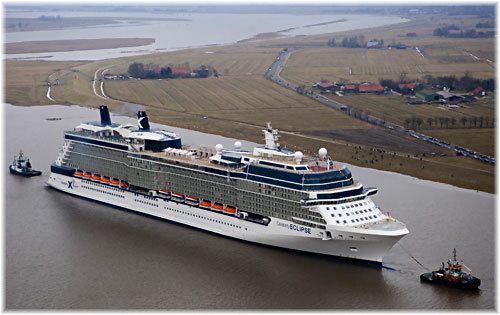 Meanwhile Princess orders another ship, while the UK-based Celebrity Eclipse is due to go in for an update. For two or three years now the travel press has been full of stories on how river and inland cruising is undergoing huge growth, not only in Europe but also around the world. Industry sources indicate that there’s been a 14% annual increase worldwide in river cruising in the past ten years. Twenty-four new river cruisers were christened in Europe this March alone. 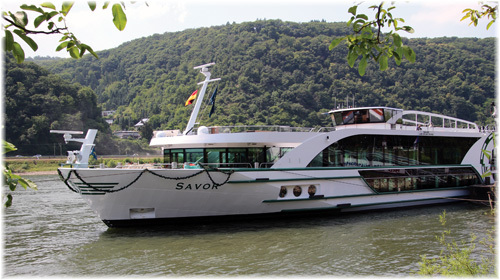 Tauck christened its sixth European riverboat, the 130-passenger ms Savor, on June 21. But now, after the numbers of river cruisers being introduced in Europe by Viking Cruises and other operators, coastal and inland cruising is also showing signs of growth in North America. River cruise guides have become de rigueur, with Steven Stern having published his first issue in 2013 and Douglas Ward the first Berlitz river guide just this year. The Official Steamship Guide in the USA now also publishes an Official River Cruise Guide, a new 152-page digital publication covering river cruises in Asia, the Amazon, Europe and North America. In America, where coasting regulations mean that vessels must be American-built, American-flag and American-owned, the 436-berth Mississippi Queen was revived in 2012 and American Cruise Lines introduced its own 150-berth newbuilding Queen of the Mississippi that same year. 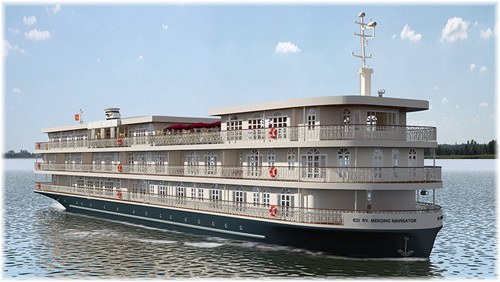 More recently, in the Columbia River, the American Queen Steamboat Company has introduced the 223-berth American Empress while Un-Cruise Adventures will move the 90-berth s.s. Legacy in from Alaska’s Inside Passage in 2015. Meanwhile, American Cruise Lines has ordered three more riverboats for both the Mississippi and the Columbia systems, the first of which was launched last month at Chesapeake Shipbuilding. A month after beginning service, American Cruise Lines affiliate Pearl Seas Cruises is exceeding expectations with its sales. The maiden voyage of the 210-berth Pearl Mist this spring was full and she carried 192 passengers on her maiden Great Lakes cruise from Quebec to Chicago. All her cabins have balconies and they start at 302 sq ft, with suites up to 580 sq ft.
Marketing itself as a coastal cruise operator, the new line also brings new itineraries to the North American cruise scene. Following in the steps of the US-flag American Cruise Lines operation, there are two main differences with Pearl Seas. The Pearl Mist is more than twice the size of the largest of the ACL coastal cruisers such as the 94-berth American Star, and she is registered in the Marshall Islands, meaning that she cannot coast between two US ports. But she does not need the more expensive American crew. Pearl Seas is now operating a series of cruises on the Great Lakes and Georgian Bay through mid-September. The Pearl Mist left Chicago on July 30 for a 10-night inland waterways cruise to Holland MI, Mackinac Island, Sault Ste Marie, Little Current, Parry Sound, Windsor, Niagara and Toronto. 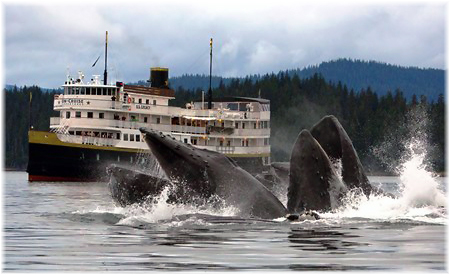 Market reports indicate that all but forty cabins are sold out for this year and bookings are now being taken for 2015. At the moment, Pearl Seas and ACL have the coastal market largely to themselves. While other lines offer Canada/New England itineraries in the autumn, it’s rare for an operator to cruise the Great Lakes or schedule a trip with stops in nine colonial ports along the US East Coast, as Pearl Seas will do. In October, the Pearl Mist begins her southern season, leaving Portland ME on a 15-night Colonial America cruise that calls at Boston, Martha’s Vineyard, Newport, Williamsburg, Charleston, Savannah, Jacksonville, St Augustine and West Palm Beach before arriving at Freeport, Bahamas. From there, she will go to dry-dock until mid-February for technical upgrades, including more teak decking. Pearl Seas, which currently shares space with American Cruise Lines in Guilford CT, is planning to move its headquarters to the Miami area by the autumn. Meanwhile, another new inland cruising operator that opened in Breckenridge, Colorado, in May 2013 has a number of vessels under construction for Southeast Asian rivers. Haimark Ltd is a new firm that takes its name from its three partners, US citizen Tom Markwell and Austrian Marcus Leskovar, both former executives of Pandaw River Cruises, and Vietnamese national Giang Hoang Hai, an experienced ground operator in Southeast Asia. Their plans are based on a 50% increase in the numbers of Asian river cruises booked in the last two years. 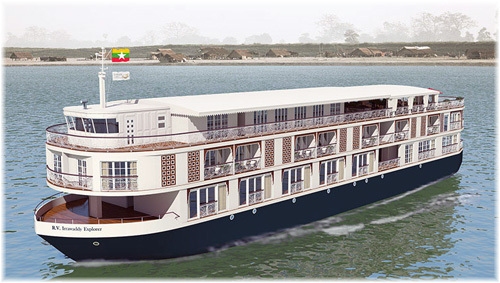 By this autumn, Haimark will be sailing the Mekong and Irrawaddy Rivers, with the Ganges soon to follow. Their vessels being smaller, most of their cruises are sold as full ship charters to tour operators. Haimark also handles land arrangements for the Uniworld Boutique River Cruise Collection and Avalon Waterways plus more than 4,000 visitors to Southeast Asia. It has recently also appointed a director of sales for Australia and New Zealand as well. Six boutique ships are now under construction. Three are destined for the Mekong, one of which has been chartered to Avalon Waterways for three years. On these cruises, buffet breakfast and lunch will be followed by table service at dinner with complimentary local beer and spirits. Pre- and Post-cruise extension programs are also available. Cruise-only fares on the Mekong Princess begin at $1,995 per person double occupancy, while those on the Ganges Explorer begin at $2,799 and the Irrawaddy Explorer at $2,899. Cabins and suites start at 255 sq ft and range up to 450 to 584 sq ft in the larger suites. Many if not most of these cruises are sold out charters and pre- and post-cruise extension programs are also available. Just announced last week is a new development of this brand. 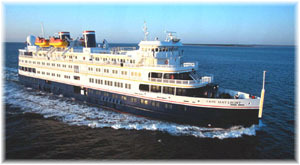 The Haimark Line has been formed to market a 220-berth ship built as the Cape May Light in 2001 for the long-bankrupt Delta Queen Coastal Cruises. The vessel, which has spent most of her life in lay-up, will undergo a $3.5 million refurbishment and be renamed Saint Laurent for a season of cruises on the St Lawrence River and the Great Lakes. Some 100 days of the Saint Laurent’s program have been set aside for Paris-based Rivages du Monde, who will offer ten 10-day departures from Montreal, calling at Kingston, Toronto, Port Weller (for Niagara Falls), Ogdensburg, Trois-Rivières, Quebec and Montreal. Double occupancy fares starting at €2,550 (about $3,500) per person will include scheduled flights between Paris and Montreal. It is expected that some of Haimark’s North Atlantic itineraries will be similar to those offered by Pearl Seas Cruises as both are non-US-flag operators, meaning they will have to sail from and to the same US port and include a foreign port of call, or sail between US and non-US ports in Canada and the Bahamas. Haimark will also offer some itineraries in the Great Lakes, details of which have yet to be announced. In South and Central America, cruises will be offered from Nassau to Cartagena, Cartagena to San Jose (Costa Rica) and San Jose to Callao, Peru (for Lima). With the huge ships, economies of scale, on board revenue generation and gravity of the masses, the Big Four cruise lines are in many ways pushing people into the hands of small ship river, coastal and inland operators that offer a more inclusive product, offering for example free wine with dinner and complimentary shore excursions in many cases. Even Regent Seven Seas Cruises has been known to say that river and inland cruising is one of its main competitors as guests expect and receive a generally more refined product than that offered by the mass-market lines carrying millions. With 11.7 million North Americans cruising every year but only about 500,000 taking a river, coastal or inland cruise, there is much room for growth. The difference in numbers can be seen when comparing so many recent ocean cruise ships orders, with 4,000 or more berths each, compared top about 160 on a river or coastal cruiser. The difference is a factor of twenty-five to one. Or as the chief executive of one smaller upmarket line, asked not long ago, how would you like to take a cruise with 4,000 of your best friends? There is indeed much untapped potential here yet! Princess Cruises, part of the Holland America Group, announced last week that it has reached an agreement with Fincantieri to build a new ship for delivery in 2017. 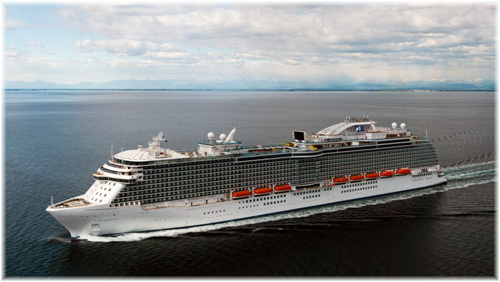 The 143,000-ton vessel will be a sister ship of the 3,560-berth Royal Princess of 2013 and Regal Princess which entered service this past May. To be built at a cost of approximately €600 million, she will also be a near-sister ship to P&O Cruises’ Britannia, a revised version of Royal and Regal Princess now under construction at the same yard for delivery in 2015. The new Princess ship will include elements that have become synonymous with the line, such as a central atrium with multiple dining, entertainment and retail venues, an adults-only Sanctuary on deck, Movies Under the Stars and eighty percent of staterooms having balconies. The ship will also include some new innovations, yet to be announced. Reportedly, the ship will be the only delivery, not only for the Holland America Group, but also for the whole of Carnival Corporation & plc, in 2017. Although details have not been announced, the first two ships in this class for were criticised for having no central staircase for passengers between Decks 7 and 18, which forces people to use elevators or to walk to the forward or aft stairwells. The same is the case on P&O’s Britannia. While this same mistake was made on the Grand Princess, Princess corrected this in subsequent ships, but that does not appear to be the case with this latest class of ship. Other criticisms of the Royal Princess, first of this design, have since been remedied. The lack of an aft pool has been remedied in both the Regal Princess and P&O’s Britannia, and Royal Princess will acquire one too. Second was the lack of an outdoors promenade on Deck 7. This was resolved on Regal Princess but passengers are still not able to walk around the ship and so must cross from one side to the other through the ship. The same will apparently be true on P&O’s Britannia, where the promenades will extend over each side of the ship. Celebrity Eclipse, which has been based at the British port since her launch in 2010 will return to the UK for its first sailing from Southampton next year on May 9 with a new dining venue, revamped pool area and an upgraded casino. As well, the ship’s Cellar Masters wine bar is being transformed into Gastrobar, serving more than 40 craft beers along with food to go with them. Orders will be placed by iPad and the Gastrobar will also offer music and entertainment. The pool area on the ship is being transformed with the addition of a frozen drink bar called Slush, which has already been installed in Celebrity Equinox. Meanwhile, the American-style casino will be modified with the addition of a dozen new British-themed slot machines, and European-style roulette wheels replacing the American ones. The line is also installing a private photo studio. From May 9, 2015, through the summer Celebrity Eclipse will offer 7- to 15-night cruises from Southampton to a range of Mediterranean destinations such as Italy, and also Portugal and Spain. She will also sail to Scandinavia and Russia.